Treadmills are the most popular home gym workout machine because just about anyone can use them and get great results. Exercising on a treadmill is a safe way to tone muscles and get a great cardiovascular workout. (Note: check with doctor before starting a new workout program). 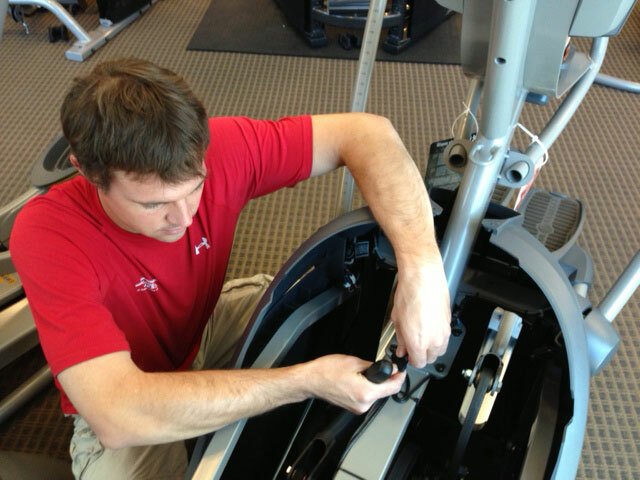 As is the case with any type of exercise machine, treadmills sometimes have mechanical issues. It’s important to address issues promptly before they become bigger problems. If you experience a slipping sensation when walking or running on your treadmill, it may be in need of minor treadmill adjustment. Most likely, the belt simply needs to be re-aligned and tightened. This is an easy thing to do – check your user’s guide for instructions but just be careful not to over-tighen. To check if the belt is too tight, lift it up in the middle. There should be a gap of about 2-3 inches. If there isn’t, the belt is probably too tight and needs to be slightly loosened. If the speed varies while you are running without you changing it, that’s a problem that needs to be addressed. Sometimes owners can diagnose this problem by themselves. Begin by checking the owner’s manual for the recommended speed setting. Set the machine to the recommended setting and then let it run without getting on it. Watch the treadmill for several minutes and determine if there is any hitching in the belt. If this happens, it means you probably need a new belt. If the machine turns off, there’s likely an issue with the motor, or the machine may have a faulty circuit. Sometimes an extremely simple problem is the culprit. Check to make sure that the plug connection is tight in the wall and where it connects to the treadmill. Any time there’s a burning smell, turn off the treadmill and unplug the power cord from the wall. Common reasons for a burning smell range from friction between the deck and back or a short-circuit in the wiring, electronics or motor. In this case, it’s highly advised to call a certified repair technician. Using a treadmill with a burning smell is a serious fire risk. If the console display won’t come on, or is not functioning properly it’s often something that can be fixed with a minor repair. Check the power cord connection and make sure it’s not frayed or crimped. If the cord is damaged, you’ll need a new one. Sometimes batteries need replaced. A magnet located on the flywheel on some machines can fall off and may need to be replaced. If the console develops static, the circuit breaker may need to be reset. Unplug the power cord for 60 seconds to fix this problem. To get specialty fitness equipment repaired or serviced in Arizona, call the certified service department at At Home Fitness.